BY A LADY. 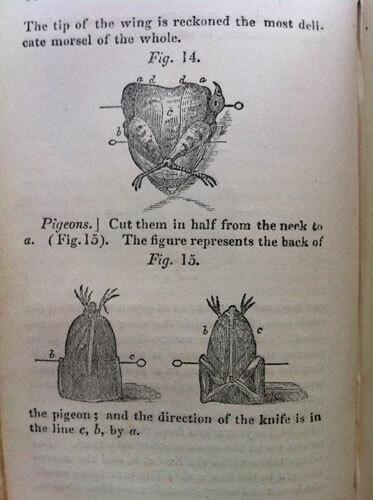 TO WHICH ARE ADDED INSTRUCTIONS FOR TRUSSING AND CARVING GLASGOW AND LONDON: W.R. McPHUN & SON, PUBLISHERS. FIRST EDITION. n/d. 126x80mm. 1fep. Title page. 1p Advertisement. 1p Contents. (1)2-114. (1)116-119 Index. (2)1-44(2) 1fep. Original purple cloth covered boards with decorative blind tooling and slightly faded but still clear gilt oval device on the front. The back is slightly sunned. The spine has been sympathetically replaced with a dark brown morocco binding with gilt lines and lettering running lengthways. Internally in fine clean condition. A very nice item. - William R. McPhun, born 1793? and died 1877, was a publisher and bookseller. After spending some years with the London publishing house of Longman, Hurst, Orme, Rees & Brown, McPhun returned to Glasgow to open a bookshop in Trongate. 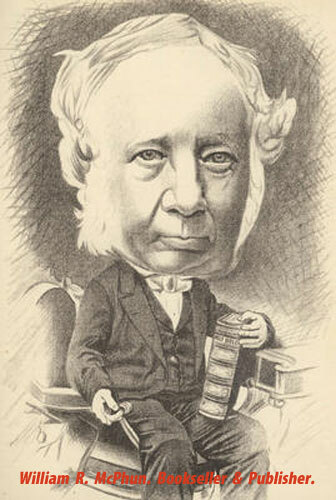 In 1842 he moved to larger premises at 84 Argyle Street. He was best known for his edition of the Workman's Family Bible, the first cheap Bible available to all classes. 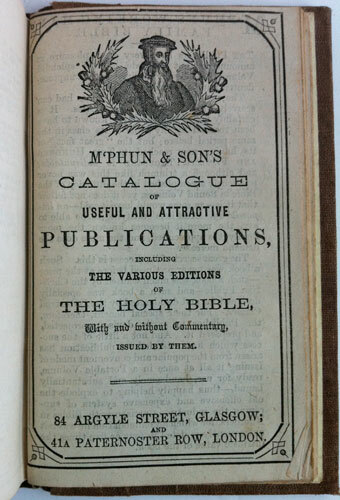 Despite opposition from other publishers and from some sections of the clergy, which included legal action, McPhun was able to price his Bible at just £1 and it proved extremely popular. 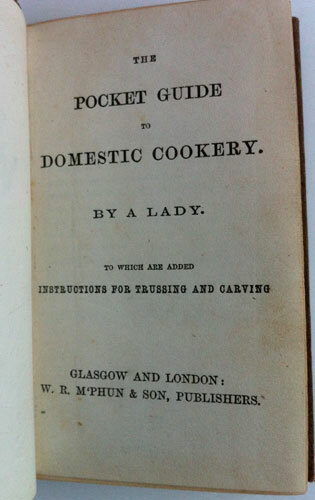 Other books published by McPhun besides this book of cookery include legal texts, guidebooks, directories and maps. (see image 6 below for McPhun's comprehensive published catalogue bound into this copy). The recipes appear to be quite thorough in their detail, giving good clear instructions and as its designed to be carried in the pocket, has an overall sense of Scottish frugal practicality. 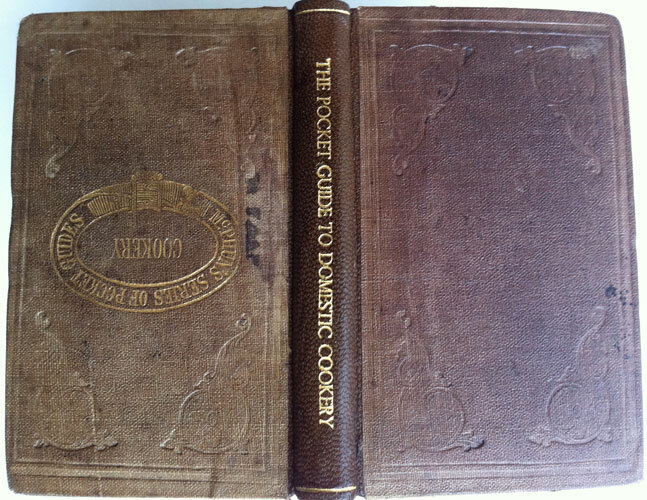 All copies of this small tome of domestic cookery are very scarce. This edition on offer here is the very rare first. COPAC informs of a 4th edition of 1836 with 119 pages in Glasgow Public Library. The BL holds a dated 1855 edition. Oxford also records an 1855 ed.